Ebony Rein was a quality racehorse and should prove to be a quality broodmare. DANE SHADOW (AUS) (2001). Winner at 1400m, NSW Tatt's RC Ming Dynasty H., Gr.3. Sire of 475 rnrs, 306 wnrs, 10 SW, inc. Red Tracer (Qld Tatt's RC Tattersall's Tiara, Gr.1), Shellscrape, Hurtle Myrtle, Shadows in the Sun, Tsaritsa, Danish Twist, Turnitup, Luen on Treasure, One Rar, Fill the Page, SP Patch Adams, Harrier Jet, Trevinder, Pharomac, Danish Spy, etc. Sire of the dams of SP Volpino and of Stick With Me, Only Leonnie, Security Choice, etc. Shadow Rein (f. by Dane Shadow). 12 wins from 1200m to 1900m, A$183,166, to 2016-17 in Aust. Ebony Rein (f. by Dane Shadow). 7 wins. See below. Balantes (f. by Excites). 2 wins at 1100m, 1400m to 2017-18 in Aust. Northern Emperor. 7 wins from 1200m to 1600m, R398,625, Clairwood Ethekwini Refactories S., Soccer 10 H., All to Come P., Greyville Alexander Forbes P., Scottsville Royal Natal Carbineers Association H., 3d Clairwood River Lodge S., Rugby 5 H.
Michigan. 2 wins at 1400m, 1450m in Aust. The Skipping Girl. Winner at 1200m in Aust. Security Choice. 6 wins to 1400m in Philippines. Gallein. Winner at 1600m in Aust. Ocean Power. Placed at 3, 3d Singapore TC Initiation P.
PHAREIN (Phar Feather). 5 wins. See above. Rein in the Tiger. 3 wins to 1400m in Aust. Sentimental Jeuney. 2 wins at 2250m, 2300m in Aust. Pinatoy. 2 wins at 1300m, 1400m in Aust. Its Reining Tricks. Winner at 1450m in Aust. Pharinfront. 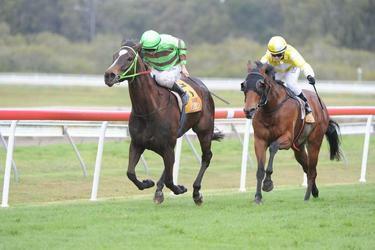 3 wins from 1400m to 1600m, 3d WATC AAMI H.
Tramein. Winner at 1200m in Aust. Run Em Down. Winner at 2 in Philippines. Emerald Rein. Winner. See above. (Mr) Irish Rogue. 3 wins at 800m, 1300m, GCTC Rothmans G C S., XXXX Country S., QTC Red Handed Graduation S.
Highett Street. Winner. See above. 7 wins to 1300m, A$105,020 in Aust.